Jackson Reef (Egypt): a sort of amusement park for scuba divers, with rollercoasters and five completely different routes. We celebrate its richness and beauty, highlighting both features and potential dangers. After the first article devoted to Lighthouse, Garden, North Jackson, we continue the series with two demanding dives: Ras Goma and Sella, the so-called Washing Machine. Starting from a depth of about 50 meters on the north-west side of Jackson Reef, a still virgin satellite reef flows south, gradually climbing up to join the west side of the next reef: Woodhouse Reef. It is one of the real gems of Sharm el Sheikh, although diving centres that do not have an inflatable boat rarely schedule this dive. Gigantic soft corals, whip corals and acropora... This reef is entirely covered with sponges and small corals! You get frequent encounters with large groupers, sea turtles, eagle rays, large tunas, and white-tip reef sharks. Less frequent - but still very likely - are the encounters with hammerhead sharks, blacktip sharks, reef grey sharks and, sometimes, dolphins. You can enter the water near the Lara wreck, on the north-west side of Jackson Reef, or after a detour into the blue, looking for hammerhead sharks, if you didn&apos;t stay too long below 20 meters, or you have enough air supply. Following the current towards the south, you slide on the west side of Jackson Reef, a bit outward. At a certain point, the seabed begins to rise gently, presenting a formation similar to a small ridge at about 50 meters. The best observation point is across the ridge, which continues to the basin between Jackson and Woodhouse Reef, a sort of satellite reef. When the outer side becomes very steep and jagged, you are close to the basin. At that point, depending on the currents, you can decide whether to re-emerge at the beautiful sea garden or continue towards the west side of Woodhouse reef, which at that point has a very attractive vertical wall, and is rich in soft corals. In the presence of strong currents, due to the profile of the seabed, intense turbulence can occur. Given the depth, it is advisable to carry out the dive in technical configuration, with sufficient gas supply and decompression mixtures, especially if you intend to combine it with diving in the blue with hammerhead sharks. In any case, try to reach the maximum depth within the first half of the dive. Currents from the South here have plenty of time and space to accelerate without too much turbulence along the side of Woodhouse Reef, a madrepora strip about a kilometre long. Imagine a thick layer of soft corals leading to a meadow of small sponges and corals that remind you of a flowery mountain pasture, populated by large grazing animals, beaten by crazy currents between two reefs, in the middle of a strait. 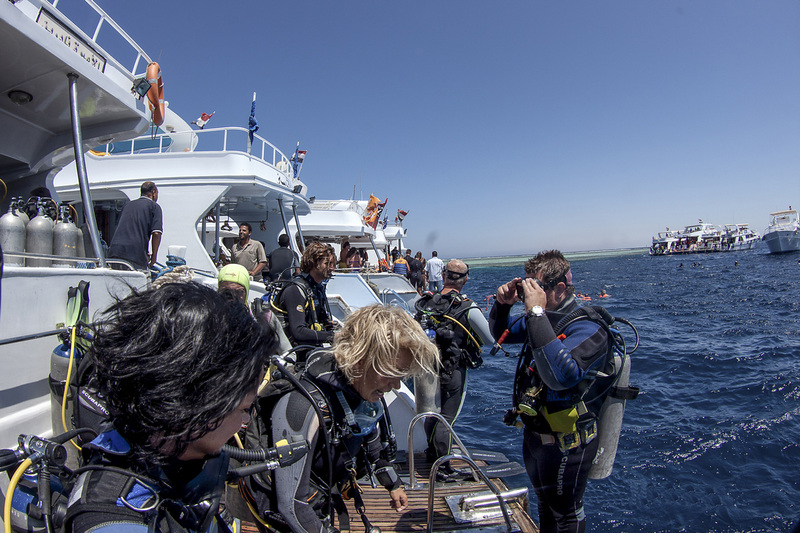 This is the most feared dive by crews and managers of diving centres in Sharm El-Sheikh. This dive is only possible when the sea is calm, and currents come from the south. You enter the water on the east side of Woodhouse Reef, just after the canyon, proceeding in neutral trim, without finning, along formations full of coral heads, soft corals and pinnacles, on a seabed of 13-18 metres. Towards the end of the reef, the current intensifies and the landscape thickens with small gorgonians. If you think that this is the maximum speed in a drift dive, you are wrong. When the semi-emerging reef sinks, that&apos;s where the rollercoasters starts... It&apos;s just like entering a washing machine. Better start to equalise, as the currents here, especially when there are some waves, will keep pushing you forward, and deeper. Once you get to the "saddle", the rising currents will start to roll, in a situation that can easily separate you from your buddy or from the group. If you encounter problems, it is better to cut immediately to the left and turn the corner of Woodhouse Reef, going back on the opposite side. If you continue, Darwin&apos;s evolutionary laws will apply: that&apos;s the place where sharks look for distracted or exhausted fish, to feed on them. The safest place is near the bottom, about 30 metres away. At the end of the journey, the gentle slope that climbs up to Jackson Reef will look like a promised land. Avoid diving if there are waves on the east side of Jackson Reef. Even if you plan a ride around the tip of Woodhouse or a cut in the blue, towards Jackson&apos;s moorings, currents can be overwhelming, and a simple cramp can be enough to find yourself in an extremely dangerous area, where rescue is problematic, even with a rubber dinghy. All divers doing this dive must be equipped with a DSMB: it is very easy to be swept away from the group and your buddy. Mastering buoyancy, and ability to manage currents are essential here, but conditions can be so extreme as to make experience not sufficient to adequately respect speed of ascent and safety stops. Big thanks to Franz, Andrea Zuccari, Francesco Pipino and Dr Adel Taher. With their experience they greatly contributed to the article, helping me better understand this reef and its laws.